Established as the seat of Navarro County in 1848, Corsicana initially attracted cotton planters due to its rich soil. With the arrival of the Houston and Central Texas Railroad in 1871, Corsicana developed into a regional trading center, and growing numbers of people settled in the town. In addition to bringing settlers, the railroad also made it easier to transport merchandise to the area, and as a result, a significant number of Jewish merchants sought their fortunes in this east Texas town. By most accounts, the first Jews arrived in Corsicana in 1871 along with the railroad. Most all of these early settlers engaged in commercial trade, and a handful set down roots that would nurture the Jewish community in Corsicana for over a century. Among the first Jews in Corsicana were Prussian-born Alexander and Bertha Fox, who lived in Louisiana before moving to Texas after the Civil War. Initially settling in neighboring Limestone County, the Fox family moved to Corsicana in the 1870s, opening a dry goods store. Their children later joined them in the family business, and the store remained open well into the 20th century. Alexander’s brother (or cousin) Simon Fox followed his family to Corsicana. He later married Lena Solomon, who had lived with Alexander and Bertha as a 16-year-old boarder in 1880. Simon started out as a saloon keeper, but later owned a dry goods business. Alexander lived in Corsicana until his death in 1922. Descendants of Alexander and Bertha lived in Corsicana as late as the 1970s. Brothers Solomon and Ruben Freedman also moved to Corsicana in the 1870s. Solomon had left Poland in 1866, while his younger brother came over six years later. They lived in Corsicana by 1876. Though Ruben was only 23 years old in 1880, he already owned a dry goods store in which his older brother worked. The two brothers remained in the dry goods business together for the next several decades. They also brought other family members to town, including their brother Alexander who owned a saloon and later a cigar stand. Louis Cerf was a French immigrant who settled in Corsicana by 1874, opening a retail and wholesale grocery business. His son I.N. Cerf joined his father in the grocery business and later became one of the city’s leading businessmen, serving as the president of a local bank. ​Despite Wessolowsky's critiques, by the time he visited the Corsicana Jewish community had already begun to establish institutions. There was an active B’nai B’rith Lodge even before Wessolowsky arrived. In 1875, local Jews purchased land for a cemetery, with the first burial occurring two years later. The Ladies Hebrew Cemetery Association raised money to maintain the burial ground. By 1891, the group had 42 members, all of whom were married women. The same sense of community which impelled Corsicana Jews to give this stranger a Jewish burial also led them to start praying together. By 1890, Jews were meeting together for the High Holidays, yet they still had not formed a congregation. Corsicana Jews found it hard to build momentum to establish lasting institutions when it wasn’t Rosh Hashanah or Yom Kippur. In an 1891 report published in the American Israelite newspaper, a local correspondent declared “as the holidays are approaching, our Jewish brethren are getting very pious and are building synagogues and temples (in their minds), but after the holidays all enthusiasm vanishes, not to be heard from again until next year.” In 1893, Corsicana Jews hired a man from New York to be a teacher, shochet (kosher butcher), and service leader, but his tenure was short-lived. In 1894, the Corsicana Water Development Company was trying to tap into a shallow Artesian well, but instead of getting water, they found oil. This discovery, the first significant oil strike west of the Mississippi River, transformed Corsicana and its Jewish community. By 1898, 287 oil producing wells were pumping in Corsicana. The oil boom attracted all sorts of fortune seekers to the East Texas town, which saw its population grow almost 50% in just a few years. An even larger discovery at the nearby Powell Oil Field in 1923 quickened Corsicana’s transformation from a cotton trading town to a major oil industrial center. This increasing economic vitality attracted more Jewish immigrants to Corsicana. Jews had spent two decades in Corsicana without having sufficient numbers to establish a viable congregation, but by the end of 1898, the city had two different Jewish congregations. Jews began to meet together regularly for Sabbath prayer in a room above the Freedman Dry Goods Store. Reform-minded members of the group broke away in 1898 to establish Temple Beth-El, while the traditionalists maintained their Orthodox services above the Freedman store. Temple Beth-El moved quickly to build a synagogue, pushed by its Ladies Hebrew Benevolent Society. Its president, Carrie Freedman, led the effort. The fledgling congregation was also able to hire a full-time rabbi, Julius Magil. 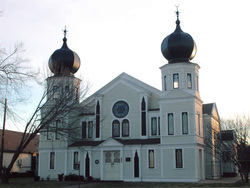 In 1900, Beth-El dedicated Corsicana’s first Jewish house of worship, a striking Moroccan style building with twin onion domes on South 15th Street. In a large public ceremony, which attracted both Jews and Gentiles, Rabbi Magil dedicated the building while several local Christian ministers took part. At the end of the dedication, Rabbi Magil paid special tribute to Carrie Freedman, calling her up to the front and proclaiming “it was you who built the temple…Had it not been for your untiring efforts there would have been no Jewish place of worship here now.” At the time of the dedication, Beth-El had 45 adult male members. Over one-third were native-born, most of whom were younger. Of the 66% of members who were immigrants, almost half were from Poland, Russia, or Hungary. Only 19% of the foreign-born members were from Germany, unusually low for a Reform congregation; another 19% were from France. 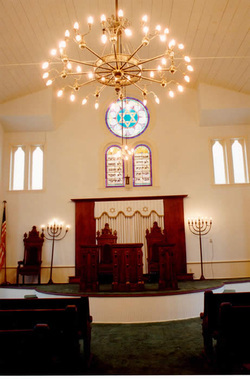 In many other American Jewish communities the split between Orthodox and Reform congregations often broke down along ethnic lines, with German Jews joining Reform temples and Russian and Polish Jews joining Orthodox shuls, but not in Corsicana, where Polish-born Jews predominated in Beth-El. Yet most of Beth-El’s immigrant members had been in the United States for many years; their average year of immigration was 1872. Thus, most were likely well assimilated by the time of the temple dedication in 1900. Almost a third of working members owned dry goods stores, while 16% owned grocery operations, and 22% owned saloons or liquor businesses. In all, 81% owned their own businesses, while 16% worked as store clerks or traveling salesmen. Only one member was a skilled laborer, Harry Levison, a cigar maker. During the oil boom, Corsicana was a rough frontier town. By 1900, it had 35 saloons, which concerned many local citizens. After a public uproar, the city passed an alcohol prohibition law, which had a significant impact on the city’s Jews, many of whom owned saloons or liquor businesses. Some chose to leave Corsicana, while others, like Simon Fox and Alexander Freedman, went into other retail enterprises. 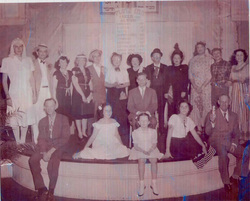 The Orthodox Jews of Corsicana moved their services to the second floor of the Odd Fellows building, and later to the American Legion Hall. In 1915, the group was officially chartered as Agudas Achim. Soon after, they built a small brick synagogue on North 12th Street, which they dedicated in 1917. A. Daw was the congregation’s rabbi at the time, leading the Hebrew services and giving sermons in Yiddish. In its early years, Agudas Achim was usually led by unordained “reverends” who would lead services, teach Hebrew to the congregants’ children, and oversee the koshering of meat in town. One local butcher shop, owned by a non-Jew, would slaughter and sell kosher beef in addition to its regular offerings, while the reverend would visit members homes and slaughter chickens for them. Morris Liebson served in this capacity from 1927 to 1935. By 1919, approximately 200 Jews lived in Corsicana, divided into two small but active congregations. Agudas Achim had 21 families, while Beth-El had 26. Despite their small size, both congregations had synagogues and full-time spiritual leaders. Only a handful of other Jewish communities in the United States were able to support two congregations with such a small Jewish population. The 1923 oil boom attracted additional Jewish families to Corsicana. By 1937, 360 Jews lived in the city. Temple Beth-El’s membership grew to 35 families in 1936. Despite this increase, the congregation often struggled to maintain its building and pay a full-time rabbi. Between 1913 and 1960, Beth-El had a series of short-term rabbis, none of whom stayed more than four years, with most leaving after only a year or two. The congregation also went several years without full-time rabbinic leadership during this period; they would bring in rabbis from Dallas or Waco to lead services twice a month. From 1925 to 1975, the congregation’s membership remained at a plateau of between 30 and 40 families. In contrast, Agudas Achim outgrew its first synagogue not long after building it in 1917. By 1932, the Orthodox congregation had moved to a former church it had purchased. Three years later, Agudas Achim hired Rabbi Harry Shapiro, who brought a new vitality to the congregation. Born in Palestine, Rabbi Shapiro had studied at Rabbi Kook’s famous yeshiva in Jerusalem and also received rabbinic training in the United States. 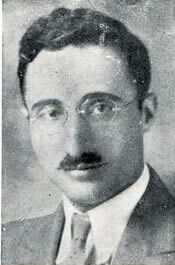 Soon after his arrival in Corsicana, Rabbi Shapiro organized a Young Judea chapter and the Corsicana Jewish Federation. 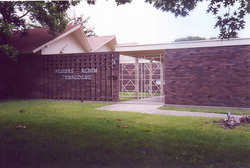 In 1957, Agudas Achim built a new synagogue on North 19th Street. Rabbi Shapiro left the congregation in 1945 and moved to Kenosha, Wisconsin. ​Members of Agudas Achim were most active in the local Zionist movement. Harry Rothkopf, who was the congregation’s first and longtime president, also served as head of the Corsicana Zionist District and led the local fundraising efforts for the Jewish National Fund. Agudas Achim members also organized the local Hadassah chapter. The women of the Orthodox congregation, although excluded from active involvement in religious services, were an important source of vitality for the community. Marie Wolens founded Agudas Achim’s religious school and served as longtime president of the Ladies Auxiliary, which worked to support the synagogue. ​By and large, Jews enjoyed tremendous acceptance in Corsicana. Yet during the 1920s, the Ku Klux Klan was very active in the city, as in many other parts of Texas. In Corsicana, the local Klan chapter had 900 members and held several public rallies. They also endorsed particular local businesses as “100% American,” which did not include those owned by Jews. Despite this campaign, the city’s many Jewish-owned businesses were not significantly affected since most customers shopped based on price and quality, not the religion of the store’s owner. Indeed, the Klan had lost much of its influence by the latter half of the 1920s. Perhaps the Klan also failed to take deep root because of the important economic and civic roles played by Jews in Corsicana. Sidney Marks, who was born in Corsicana to Russian immigrant parents, joined his father’s dry goods business by 1910, building it into one of the leading department stores in Corsicana. Later, he opened a successful advertising agency. Marks was an active member of Temple Beth-El, often leading services when they did not have a rabbi, and serving many years as its president. Marks was also involved in the larger community. He was a founding board member of the Drane Foundation, which aided citizens of Navarro County, and was involved in many other local charities. In 1963, the local Chamber of Commerce named Sidney Marks Man of the Year. Kalman Wolens left Russia in 1893, initially settling in Chicago. During the first decade of the 20th century he moved his family to Corsicana, where he started peddling eyeglasses on the street. After borrowing money from a member of the local Jewish community, he opened a small clothing store. After achieving some success in the business, Wolens bought a small parcel of land outside of town in 1914. This land turned into a winning lottery ticket when oil was discovered on it in 1923. Wolens used the proceeds from his oil windfall to expand his K. Wolens stores to towns across the state. At its peak, the K. Wolens chain had 63 locations. Many Jews came to Corsicana to work for the business, which finally closed in the 1990s. The Wolens family was very philanthropic, giving $50,000 to the local hospital and establishing a foundation to support other civic projects. For his beneficial impact on Corsicana, Kalman Wolens was named Man of the Year by the Chamber of Commerce. The Wolens family was also strongly committed to their Judaism. Kalman strictly followed the Jewish dietary laws; his wife Ida raised chickens so they could be killed according to kosher law. They were also major financial supporters of Agudas Achim. While Corsicana’s economy suffered during the Great Depression, the local oil industry remained relatively strong. During World War II, increased industrial production along with a nearby military pilot training base led to flush times once again. After the war, the city continued to flourish, with several local industries, including Wolf Brand chili and tamales, the Collin Street Bakery, which shipped its DeLuxe fruitcakes all over the world, a hat manufacturing plant, and an iron works that made oil drilling equipment. Indeed, oil was still king, making Corsicana one of the state’s most prosperous cities per capita in the 1950s. Jewish merchants benefited from this general prosperity. P. Samuels Men’s Clothiers, which had been founded in 1897 by Phillip Samuels, remained in operation until it closed in 1990. Phillip’s son Irvin Samuels ran the business for many decades. After the war, Jewish merchants continued to predominate in Corsicana. In addition to dry goods and clothing, Jews also owned grocery, hardware, and jewelry stores. Jews were also very involved in the theater business. M.L. Levine ended up in Corsicana in 1911 when his train heading to Tyler crashed in town. After spending time in the local hospital, he noticed the need for a movie theater in Corsicana. He purchased a local theater, which he named “The Cozy.” In 1913, he built a grand new theater called “The Ideal,” which had three balconies and elaborate musical orchestration. In the 1950s and 1960s, Sidney Miller owned several movie theaters in town, including the Starlight, which catered to African American customers. For the Orthodox members of Agudas Achim, the retail trade often challenged their traditional religious practices. Although many of them kept kosher, the rules about not working on the Sabbath were difficult to uphold since Saturday was their busiest day of the week. To close their stores on that day would make it almost impossible to earn a profit. So most chose to work on the Sabbath, even as they maintained their identity as Orthodox Jews. In one instance, an Orthodox Jew got around the letter of the Jewish law by having only non-Jews work in his store on Saturdays. He would walk around the store, but would not handle money or count the receipts until after the sun went down. Despite these compromises, the members of Agudas Achim remained committed to preserving their traditions. In 1956, Ernest Joseph, who had fled Nazi Germany with his parents before the war, came to Corsicana to work for the K. Wolens Company. When Rabbi Shapiro retired from Agudas Achim in 1964, Joseph would lead services and teach Hebrew school for the congregation. Impressed with his abilities, the Wolens family paid for Joseph to receive rabbinic training at Orthodox yeshivas in St. Louis and New Jersey. After he received ordination in 1966, Joseph became the full-time rabbi of Agudas Achim. Despite the prosperity of post-war Corsicana, its Jewish community did not grow. By 1960, only 210 Jews lived in the city, down from a peak of 360 in 1937. Increasingly the Jewish children raised in Corsicana sought greater opportunities elsewhere. The generations of Jewish merchants faded as Jews entered the professions in greater numbers. This movement out of the merchant class explains why Corsicana’s Jewish population has declined in recent decades at a time when the city itself continues to grow and flourish economically; today, Corsicana’s population is larger than it has ever been, yet its Jewish community has dwindled to near extinction. Perhaps the first sign of this was the decline in Temple Beth-El. Since 1960, the congregation did not have a full-time rabbi; they would periodically bring in visiting rabbis from nearby cities to lead services. In 1968, Rabbi Ernest Joseph agreed to serve Beth-El as well. He would lead Orthodox Friday night services at Agudas Achim at 6:15, and then Reform services at Beth-El at 8 pm. The two congregations also combined their small religious schools. Between 1968 and 1978, the Corsicana Jewish community endured 38 funerals, while celebrating only three births. By 1978, Beth-El only had 41 individual members. Two years later, the members of the Reform congregation decided to disband and sell their historic building. Most of the remaining members joined Agudas Achim, which had moved away from strict Orthodoxy toward Conservative Judaism. Because of Temple Beth-El’s architectural and historical significance, the Navarro County Historical Society bought the building in 1982, and spent the next few years raising money for its restoration. In 1987, the society rededicated the building, which was now listed on the National Register of Historic Places, as a cultural center and community meeting space. The beautiful building still serves the Corsicana community today. In the 1980s, the Jewish population of Corsicana continued to shrink. By 1987, only 52 Jews remained in town. When Rabbi Joseph died in 1999, Agudas Achim finally decided to close. They sold their building to the city, which now operates it as a senior center. By 2000, there were only a few Jewish families remaining in Corsicana, though they still gathered together for services each Friday night in their homes. Babbette and Irvin Samuels, two of the last holdouts, worked to ensure that the legacy of Corsicana’s Jewish community was preserved. After Irvin passed away in 2004, Babbette continued to take care of the cemetery. The Jewish community has remained active, despite their small numbers. Once a month, the six remaining Jews in town, along with a handful of others from the surrounding area, gather in the old Beth-El temple for services led by Rabbi Frank Joseph, the son of Ernest Joseph, who drives in from Dallas. Although there is no longer an official congregation in town, this small group has kept Judaism and its heritage alive in Corsicana.